The governor of Puerto Rico is requesting more federal funding for the hobbled island as it struggles to return to normalcy nearly three weeks after Hurricane Maria hit. About 40 percent of Puerto Rico is still without water, and more than four in five residents don't have power. Gov. Ricardo Rossello said in a letter to Congress Monday that, "in addition to the immediate humanitarian crisis, Puerto Rico is on the brink of a massive liquidity crisis," meaning that the government may soon be dealing with a shortfall of cash. Rossello said the island is grateful for the help it's gotten so far — the Trump administration last week asked for $29 billion in disaster aid for U.S. hurricane relief — but needs about $4.6 billion more money in an emergency "down payment on hurricane recovery efforts." Puerto Rico was devastated by Hurricanes Irma and Maria. The latter killed 38 people and knocked out the island's already-crippled power system. The clean-up is continuing, albeit slowly, especially outside of San Juan, but it will likely be months before the island gets back to normal. Adding to the situation's complexity is the island's long-standing debt. 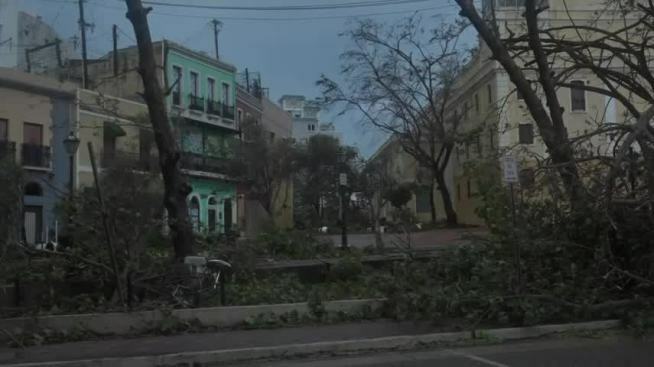 One damage estimate cited by Rossello, from credit rating firm Moody's, puts the cost of Hurricane Maria at $95 billion, which is one-and-a-half times the island's gross national product. The rebuilding effort will make it harder to pay back the more than $70 billion Puerto Rico owes its creditors. The island is most in need of more housing and development funds called community development block grants, according to Rossello's request for $3.2 billion of it. President Donald Trump, who visited the island last week, has been insistent that his administration's response has been more than adequate, tweeting Sunday, "Nobody could have done what I’ve done for #PuertoRico with so little appreciation." Others in Puerto Rico argue that the United States owes more to the 3.4 million American citizensin the territory. San Juan Mayor Carmen Yulin Cruz has been one of Trump's most vocal critics, tweeting several times on Sunday, "Increasingly painful to undestand the american people want to help and US Gov does not want to help. WE NEED WATER!" That day, the head of FEMA, Brock Long," referred to her comments as "political noise" that the disaster response agency is filtering out. While 68 percents of the San Juan metro area has access to drinking water, just 31 percent does for the northern region of the island, according to Puerto Rico's government. Rossello on Monday said he ordered an investigation into complaints that water and food supplies weren't being delivered quickly to people in need in some municipalities, Reuters reported. He warned on CNN that there would be "hell to pay" if local authorities weren't delivering it to those in need. As for the federal response, Rossello has stayed above the political fray over whether the administration's efforts have been adequate. "I don't get involved," he said when asked on CNN Monday about the spat between Long and Yulin Cruz. "There has been great collaboration with the [Department of Defense], with the federal government, with the state governments," Rossello said on MSNBC Monday. "But we still need to do more and we need to focus on the mid run and the long run so we don't just put Puerto Rico back together again, we put it -- we build it, we transform it better than ever."